A dog needs a lot of exercise, and if you don’t have a large back yard, that means taking your canine companion on daily walks to give them the exercise and the fresh air that they need. To ensure that they are safe from cars, other forms of traffic, and even other dogs while you are on your walk, many pet parents keep their dogs close with a leash, but that can cause another type of concern. Some dogs like to tug at their leash to try and rush ahead, chase a squirrel, or simply follow a scent. A harness is a type of collar that is going to remove the stress placed on their neck from pulling at their collar, but which harness is going to be the best option for your dog? We have compiled four different options for you to consider; three of them are top picks and the fourth is a budget friendly option. Our gold pick is a selection that is loved by critics and consumer s alike. 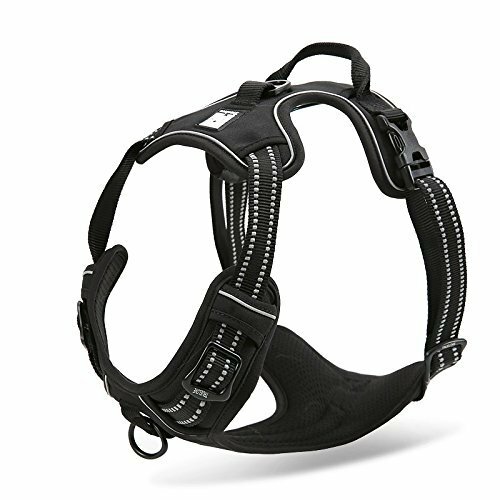 The Chai’s Choice no pull harness is a great device that is great for any dog. The harness is made from a nylon material that is designed to be durable for years. The outer material is scratch resistant, and the interior of the harness is complete with a mesh liner that is designed to be more comfortable against your dog’s skin. This dog harness is designed to fit dogs of many different sizes, so it is available in five different size options. You can determine which size is best for your dog by measuring the circumference of their chest. The harnesses are available in extra small, which is 13 inches to 17 inches; small, which is 17 inches to 22 inches; medium, which is 22 inches to 27 inches; large, which is 27 inches to 32 inches; and extra large, which is 32 inches to 42 inches. The straps on this harness are also adjustable, which means that you can change the length of the strap to better accommodate the size of your dog. In addition, the straps are covered in a reflective material that is designed to make night walks safer for your dog. There are two separate leash attachments that you can use. The first one is a D ring that is located on the back of the harness, and the second is an O ring that is located on the chest section of the unit. There is also a handle on the back of the harness that can be used to assist elderly or injured dogs up the stairs. It can also be an area to grab when your dog tries to run or a feature that can be used to securely belt them into the car. This harness is available in black, bright green, or bright orange, and it comes with a 30 day money back guarantee. Our silver pick is a harness that is very similar to our gold pick, but the differences may make you select this option over our top pick. The OLizee No pull dog harness is a great option for most dogs, whether they are big or small. The harness itself is constructed from a breathable nylon material that includes a mesh lining on the inside of the device. This means that your dog’s skin will never get pinched from the harness and they will experience a comfortable walk any time you take them out. The harness is designed to help eliminate the stress that a collar can cause a dog who likes to pull and tug on their leash. The exterior of the harness is designed with a scratch proof material which makes it a more durable option. The straps are made from a 3M reflective material that makes it easier to see your pet around the hours of dusk and dawn. In addition, the straps can easily be adjusted to accommodate the size of your dog. There is also a handle that is located on the back of the harness, which can be used to quickly grab a dog who decides that it’s a good idea to chase a squirrel. 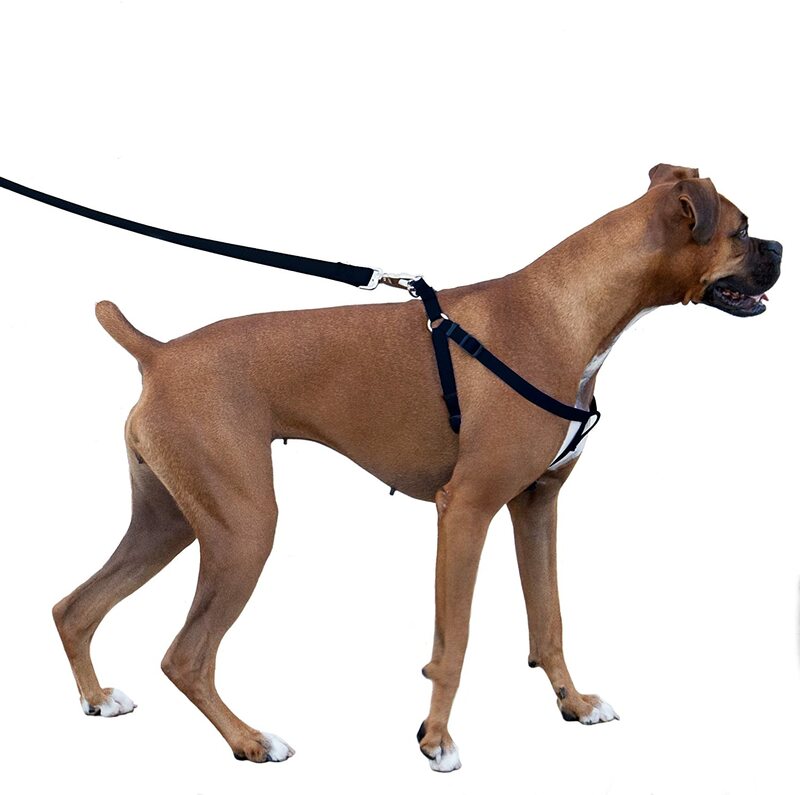 This durable harness is designed with two zinc alloy leash attachments. One is an O ring that is located on the chest of your dog when the harness is in place, and the other one is a D ring that will be located on your dog’s back when they have the harness on. This harness is available in five different sizes, which include extra small (13 inches to 17 inches), small (17 inches to 22 inches), medium (22 inches to 27 inches), large (27 inches to 32 inches), and extra large (32 inches to 42 inches). These sizes refer to the circumference of the dog’s chest if you would like to measure your dog before making a purchase. 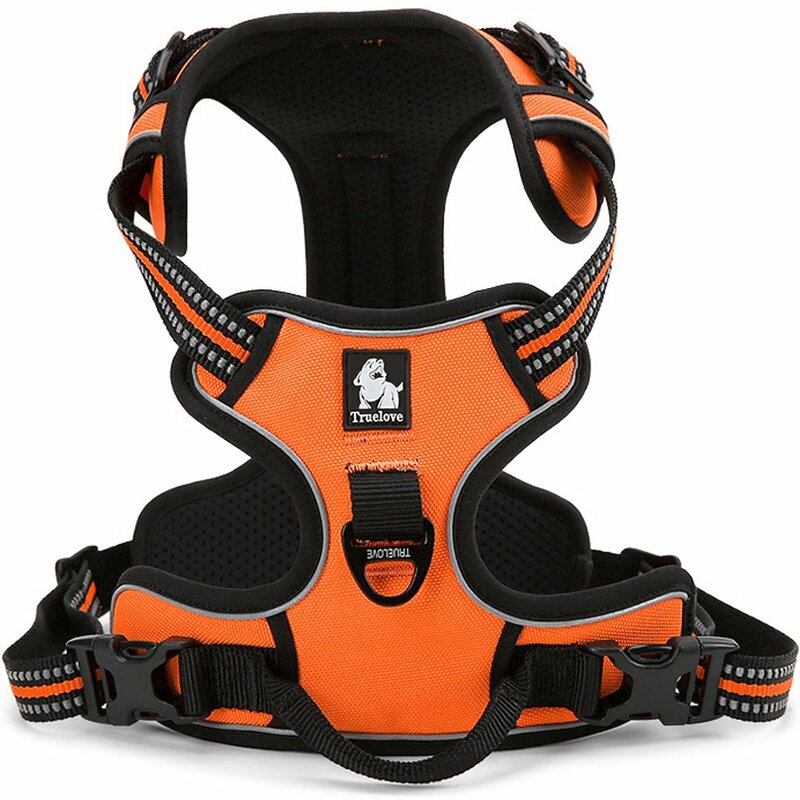 In addition, this harness is available in black, orange, and green and it comes with a 30 day money back guarantee. Majestic Pet originated in 1994 manufacturing collars and leashes for dogs. Since then, they have expanded into other pet care areas, but the innovation and the care behind these original products is what placed their no pull harness and leash combination on our list as our bronze pick. It is a bit different in design than our first two picks, but it is still a well made nylon harness that is extremely durable. The harness is designed to be stepped into by your dog with their two front paws. You will then pull the straps up over their back and clasp the harness together on their back. It is a lightweight unit that is designed to be easily adjusted to snuggly fit the shape of your dog. In addition, the stitching is a double locking stitch that will not easily unravel during play. The leash attachment is a D ring that is located on the area of the harness that is located on your dog’s back. One great feature of this no pull dog harness is the fact that the manufacturer decided to include a six foot leash in the packaging. There are three different size options that are available for purchase, which are small for dogs who have a nine to 15 inch chest, medium for dogs with a chest between 15 and 25 inches, and large for a chest range of 25 to 40 inches. The harness is available in seven different colors to match your dog’s personality. You can select red, black, blue, green, pink, burgundy, and purple. The best part is that the included leash will match the color of the harness you select. There is also a 90 day money back guarantee included with the purchase of this dog harness. If you are looking to try out a less costly no pull dog harness, then our fourth pick may be for you. 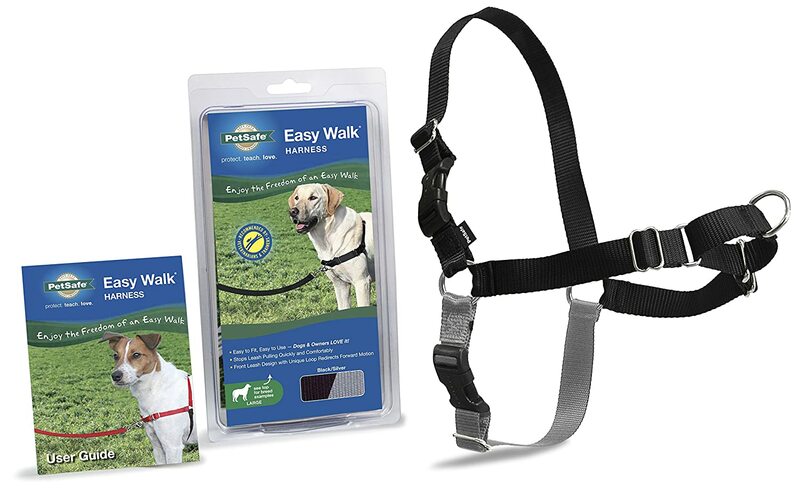 PetSafe is a company that strives to create durable pet products at a low affordable price point, and this easy walk dog harness is no different. It is made from a strong, but soft nylon material that is designed to prevent the harness from rubbing on your dog’s skin. It features a step into design that is easy to attach onto your dog, and it is simple to adjust at one or more of the four locations where the straps adjusters are located. The front of the harness that will sit on your dog’s chest is designed with a marginal loop near where the leash attaches that will help prevent the harness from twisting. The leash attachment is a standard D ring that will secure the leash in place. The three strap design is intentionally two different colors to help you decipher the direction you should put the harness on your dog with minimal effort. The chest and back strap can be purchased in black, green, red, purple, pink, brown, blue, and raspberry. The strap that goes behind your dog’s front legs will be a different color, but it will be one that compliments the primary color well. For example, one color combination is purple and black, and another option is raspberry and grey. 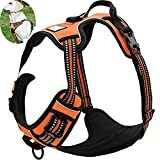 Most harnesses are designed as a combination of straps that connect together and support your dog’s chest area instead of going around their neck. Each harness differs a little, but there is typically a strap that is located across their chest and then another one that is behind their legs to secure the harness in place. Make sure that the harness you select does not cut into your dog’s neck or shoulder in any way. Any harness that you purchase needs to be adjustable. Dogs vary in shape and size, so you need to make sure that all of the straps on the device adjust. There are typically at least two places where the harness can be adjusted; the first location is on the chest strap and the second is on the strap that is designed to go behind their front legs. The harness should be snug and comfortable on your dog; never tight. A harness that is too tight can cause your dog to have irritation that can lead to fur loss or sores on their skin. Dogs vary in shape and size, and as you can image, a harness that is designed for a small lap dog will not fit well on a larger German Sheppard. Harness sizes range from petite, which is for a dog with a chest size of about six inches and a girth of about 12, to an extra large, which should accommodate a chest size of 23 inches and a girth of about 50 inches. The best way to make sure that a harness fits your dog properly is to measure them. First, take a chest measurement across their breast bone to about an inch past their front legs, and then measure around their rib cage right behind their front paws. You will want to make sure that the connection point for the leash is in a good location. Most harnesses have the attachment loop connected to the area that will be on the back of your dog, but some do have the fixture located on the chest. Consider your dog’s habits when you decide which type of leash attachment will work best for your needs. Safety should be major concern when it comes to your dog, so it is important to make sure that the harness you choose is not going to dig into their skin and cause them discomfort. Some harnesses have strap covers that are designed to keep the straps from rubbing. Another feature that you may wish to consider is reflective material that is easily visible in the dark, especially if you take your dog on walks along the side of the road. Some harnesses even have a seatbelt attachment that is designed to secure your dog in the car. This is a great addition, especially for dogs who get so excited during a car ride that they end up running back and forth across the back seat. This feature will ensure that they are safe if you have to make a sudden stop. Some dogs do not like having a collar or a harness on their body, so they attempt to remove it by scratching it off. To accommodate for this, some harnesses are designed to be scratch proof, which means that they are less likely to be damaged. Make sure that the stitching on the harness is strong enough to hold up to your dog’s strength. You want a harness that can be used for years, not one that will be worn out in mere weeks. After you decide on the functionality that you need on a dog harness, the rest is pure aesthetics. Some dog parents like to match their dog’s accessories, so if that is important to you, then you may want to choose a color that will represent your dog’s personality. A good suggestion is to purchase a bright color that will reflect the light of oncoming traffic; this will add an additional level of safety to the harness. Often times you can also purchase a leash to match the harness you select. The style that you choose is completely up to you, just make sure that the one you select works for your dog. A no pull dog harness is a great way to keep your dog from injuring their necks while they are on a walk. Some canines are simply too excited when they are outdoors, so they tend to pull and tug on their leash, which can be dangerous for them. We know that you want your dog to be comfortable and safe during their outdoor time, so we have devised a list that is designed to help you decide which options are best for you and your dog. If the options we have selected as top picks are not great options for you, then hopefully our pre-purchase considerations can help you find the harness that you are looking for. Once you find the perfect harness for your dog, it is happy trails from there.